I am sick and tired of national folks taking political jabs at my south Georgia congressional delegation. The fellows need to jab back. My rural south agenda focuses on agriculture, education/jobs, military/veterans and transportation. If they take care of those areas, other stuff is secondary because all politics is local. My Georgia is the area south of a line from Columbus to Macon to Savannah. “JABS” could be Jack, Austin, Bishop and Saxby as in Rep. Jack Kingston, Rep. Austin Scott, Rep. Sanford Bishop and Sen. Saxby Chambliss. Of course, Senator Johnny Isakson is the coolest of the cool and we appreciate his ATL-based service as well. Party politics requires these guys to publicly act combative with each other but we know that JABS circle the wagon when Georgia issues are on the table. Sen. Chambliss catches heat from the far Right when he negotiates with Democratic senators but kuckleheads should know that negotiating is what leaders do. Jack Kingston can throw policy jabs with the best of them but coastal Democrats will admit that Jack will go anywhere to explain his rationale and many African American conservatives have worked in his D.C. and district offices; the same can’t be said about most GOP congressmen. The Austin Scott and Sanford Bishop areas of south Georgia are interesting because the recent changes to the congressional map made Bishop’s district more Dem-friendly and Austin’s area more GOP friendly. Does this mean Bishop is going to become more liberal? No. Actually, Bishop, as an appropriator, has become more of a fiscal educator during his Georgia visits. Of course, he isn’t as fiscally conservative as Austin Scott but considering SDB’s district he does more than expected and hears it from real liberals. The new map will move my hometown from Bishop’s district to Austin’s district but that is fine with me because interests don’t stop on political lines. Kingston has always protected Naval Air Station Jacksonville because many employees from that base live in southeast Georgia and a similar situation exist between the 8th district and the 2nd district. People live in rural towns but work, dine and shop in Albany, Columbus and Macon. So, the conditions in both areas are contingent or mutual. I am keeping my eyes on JABS and would love to see them use the basketball fundamental technique called the jab step to get the national haters off them. In basketball, this moved is used to create space from the opposition before executing one’s next scoring move. Jack, Austin, Bishop and Saxby deliver or score for south Georgia but I need them to be more vocal about their achievements. And if an occasional misstep occurs, Georgians can weigh the good vs. the nots-so-good and decide. For example, we heard a lot of drama about candidate Nathan Deal but he has been a decent governor who is about to overhaul the expensive criminal justice system in this state. We spend too much money on criminals and change starts with education. Look, people have agendas and you can detest folks for working their hustle. But, national groups can’t tell me that JABS are wrong; those guys are fellow Georgians and we will make that determination on our own. As a matter of fact, regular Georgians should use the web and public events like our unlikelyalliesproject.com meetups to discuss our elected officials. Okay, I finally get the House Tea Party Caucus. From jump street, these members stated that they were there to address the spending and that they didn’t care about being long-term members of congress. The Progressive Caucus on the far left and the T.P. Caucus on the far right aren’t team players and love that fact—rebels, renegades, revolutionaries. It took me awhile to realize that many members of the state legislators were balling so hard in private life that being a U.S. Congress member would be a pay cut or take them from their families too much. The state house and senate isn’t the minor leagues to congress. With that in mind, some ballers feel that it might be cool being a congressman for a quick minute so they run, win and roll into D.C. with a creep-type attitude. They think they know everything but the job is complex and complicated. Senator John McCain is a guy about order. As a POW, he had an opportunity to bounce out of captivity but didn’t out of respect for his fellow prisoners. Recently, he gave the Tea Party Caucus his behind to kiss because protest and governing is two different things. Speaker Tom Foley use to say that a jackass could kick down a barn but it took a carpenter to build one. Tea Party have provided some useful protest but legislating requires compromise and negotiations. We should hand-out cool points to young members of congress like Rep. Tom Graves and Rep. Austin Scott of Georgia who (while really conservative) didn’t let the tide push them into the Tea Party Caucus. Sen. Saxby Chambliss gets cool points for his work with the Gang of Six and yes, that will get him a Tea Party primary opponent. As conservatives go, some are “less worst” than others and this moderate still can’t understand why the Tea Party movement hates centrists like Rep. Sanford Bishop who is with conservatives a surprising percentage of the time. McCain did what Bishop should have. Update: I just saw “the social network” and found a cover of “Creep” that use in the movie’s trailer. I am a good American who wants the best people governing. While I support candidates I find competent of any party, a quagmire results from deciding if I should hope for an opponent who is easier for my guy to beat or hope for a quality person who would serve well if elected. Obama is my guy in 2012 but I have issues with friends who gleefully want the worst GOP candidate in November. What if that zany person actually wins? Hillary Clinton, Mitt Romney, Mitch Daniels and Jon Huntsman are presidential material and if the economy doesn’t improve Obama himself might see the logic in letting someone else have at it. Newt, Newt, my homeboy Newt is clearly an ideas guy whose intelligence and vision would be helpful to the nation but he likes to toss fire and that’s not cool. In Georgia congressional politics, moderates must face the reality that Democrats help people who don’t bother voting—oh, they can go to every freaking high school football and basketball game but can’t find 10 minutes to vote. If elections are to be decided in the primaries, we should support reasonable GOP candidates running against out of touch candidates or help out of touch candidates better understand all of the electorate. If not, we might have elected officials who developed their points of view in a bubble…a strange angry bubble where everyone is like everyone else. Cain vs. Obama would be cool with me because Cain would say what needs to be said to regular folks. I think Democrats and Black folks should spend some time listening to Herman Cain and the rest of the GOP field. Their concerns are valid and solutions are often sensible—their methods and disposition need some work. In a strange twist, listening to the conservative side helps President Obama because moderates better understand why he is seeking common ground with them. I am a positive guy and if any conservative wants to talk about why their temperament is often off-putting, I am right here and eager to teach and learn. 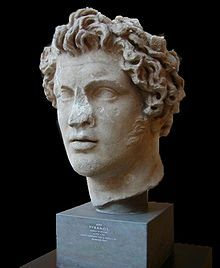 Bottomline: constantly angry is no way to go through life. Columnist Cynthia Tucker wrote a nice one this week about Georgia Senator Saxby Chambliss catching heat for negotiating in the Gang of Six group. Why in the world would someone dislike an elected official for doing his job? Tucker is correct: the ultra conservatives and the ultra liberals need to stop tripping. We should remember that these two groups are a fraction of the American people but they are vocally involved and we all know that the squeaky wheel gets the grease. There is a controversial painting of all American presidents that includes President Obama standing on the U.S. Constitution. The guy was president of the Harvard Law Review and a University of Chicago constitutional law professor but he doesn’t respect the Constitution. Really? I saw the painting hanging in the district office of U.S. Rep. Austin Scott. Readers of this blog know I appreciated GOPer Scott removing Rep. Jim Marshall because Marshall, a law scholar himself, decided that Speaker Pelosi and the White House wasn’t his cup of tea. The two Georgia U.S. Senators, Scott and Rep. Jack Kingston are the most bearable Republicans in Georgia because they are good guys in person. But, the ultra conservatives are busy and seemingly require that the GOP leaders limit input from Democrats. Kingston has a well-earned reputation for going to policy-hostile events and breaking down his voting record. That’s how you do it and Bishop, Barrow and even Marshall did the same. If the picture is in Scott’s office, it is there because Scott feels that the White House’s policy contradict the framers intend; Scott is on a fiscal correction mission. When Rep. Sanford Bishop was a freshman, his Washington office initially didn’t have Georgia flag outside the front door. In an interesting twist, Bishop got the old flag (stars and bars included) but state legislator Austin Scott was (I think) the only GOPer who support changing that flag and he caught hell for it. 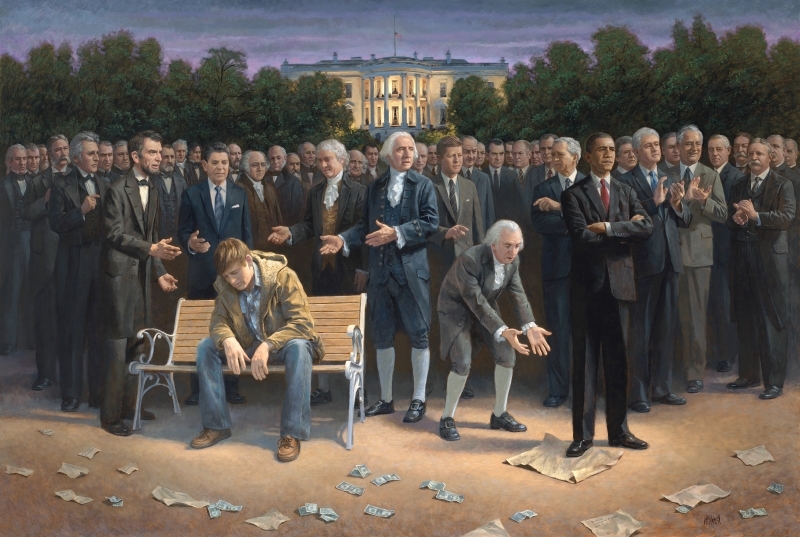 The artist who created “The Forgotten Man” said he knew the work was a little strong and I personally think it is too strong. I always respect President George W. Bush and argued with those who thought he wasn’t bright—dumb people rarely graduate from Yale. The birther junk and whatever comes next are insults and thank you to those of the other side who want to stick to the issues. I saw the facebook video statement of Rep. Scott regarding the killing of Bin Laden and yes, he was of the few conservatives who gave President Obama credit. Democrats have always allowed Bishop, Barrow, Marshall and other Blue Dogs flexibility to included conservative elements in their actions because conservatives are Georgians too. I am concerned that the far Right will not allow the same leeway to any GOP members of congress. Of course, the views of real liberals fall on death’s ear but even moderates and centrists should keep an eye on redistricting and hope that they end up in moderate districts. When Jon Stewart said that Bill O’Reilly was the “thinnest kid at fat camp,” he meant that O’Reilly was the best person at Fox News and one might say the same about Sen. Saxby Chambliss (Gang of Six) and Austin Scott. Jon McNaughton’s The Forgotten Man is art and art is designed (like Spike Lee’s and Tyler Perry’s work) to provoke thought. You be the judge.